MINI OSCARS - 4 FOR COTSWOLD MINI! 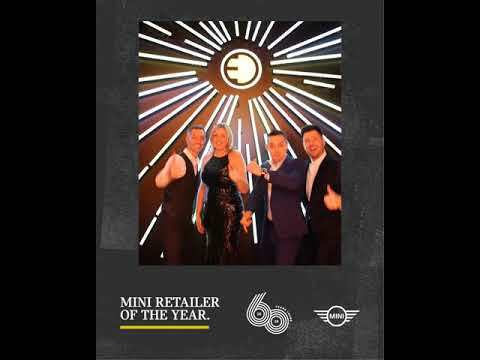 We are delighted to announce 17 January Cotswold MINI scooped 4 of the 9 awards at the MINI RETAILER OSCARS held in Liverpool. Cotswold Cheltenham MINI won: 'APPROVED USED MINI RETAILER OF THE YEAR' and the prestigious ultimate award: 'UK MINI RETAILER OF THE YEAR'. Cotswold Hereford MINI won 'RETAIL SALES OF THE YEAR' and 'UKL2 (MINI CLUBMAN AND MINI COUNTRYMAN) PERFORMANCE OF THE YEAR'. We are delighted to say this is the fourth time Cotswold MINI has bagged MINI Retailer of the Year; Cotswold Cheltenham taking first place in 2009 and 2018, and Cotswold Hereford in 2013 and 2015. Photo shows MINI Brand Manager Jennie Seeley (second left) receiving the MINI Retailer Of The Year Award award from David George MINI UK Director (first left), Graeme Grieve CEO of BMW/MINI Group UK (far right) and Presenter Tess Daly. Photo shows Head Of MINI Sales Steve Liddle (centre) receiving the MINI Retail Sales Of The Year Award award from Rob Turnbull, Head of Sales MINI UK (left) and Presenter Tess Daly (right).